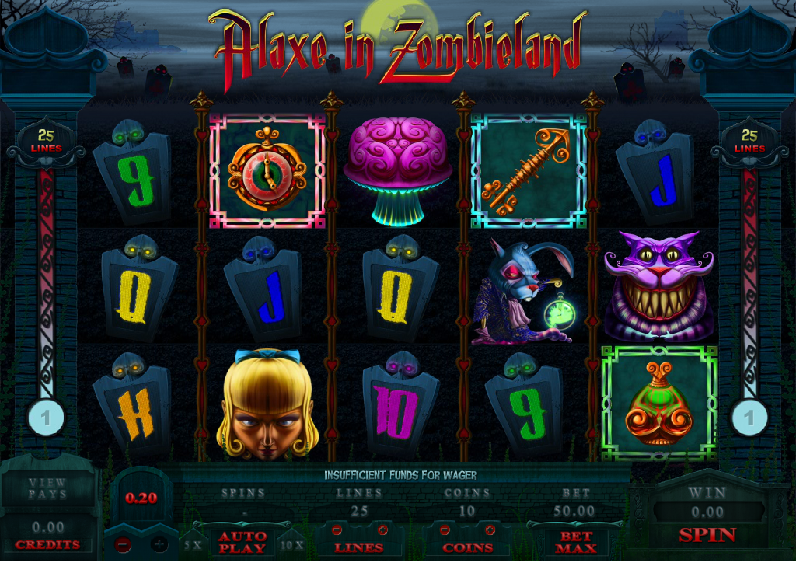 Designed by Microgaming, Alaxe in Zombieland is a strange but gloriously ghoulish online slot which is a zombiefied take on Lewis Carroll’s Alice in Wonderland. Alice is Alaxe and several other characters from the novel also make an appearance. Alaxe in Zombieland has five reels and twenty five paylines and it’s fair to say that it’s played within a very gloomy atmosphere so your eyes make a take a minute or two to adjust to the shadows. It’s all set in a graveyard with a yellow full moon rising in the distance. The main symbols are Alaxe herself and then there are three delightfully ghoulish creatures representing the Mad Hatter, the Cheshire Cat and the White Rabbit . 9, 10, J, Q, K and A inscribed on graves make up the numbers. Bonus symbols are three different scatters – a watch, a key and a green-tinged ornament – and the wild is a pink brain. Trigger this bonus by landing three of the watch scatter symbols on reels one, two and three; those symbols will turn into tea pots so select one and the number revealed will determine the number of picks you get in the next screen. Here the reels are full of more tea pots so you can manually select the given number or use the ‘Autopick’ button in the middle. Each tea pot will award a number of free spins and maybe a multiplier. Now click ‘Spin’ to start the free spins! Three key scatter symbols on reels two, three and four trigger this feature and the player will be presented with five tombstones, each with a cash value. You must begin with the tombstone on the left and you should pick three of the displayed white flowers to turn red. Each of your chosen flowers will reveal a reward and when they are totalled must be equal or greater then the value of the tombstone. You then get to move to the next tombstone. If you make it to the end you will be shown six doors; behind one is the Red Queen but behind the others are multipliers which will be applied to your winnings. Three of the green ornament scatter symbols on reels three, four and five will activate this feature and you will shown a number of gravestones; pick which ones you want to slice to reveal a prize and keep doing this until you reveal a ‘Collect’. 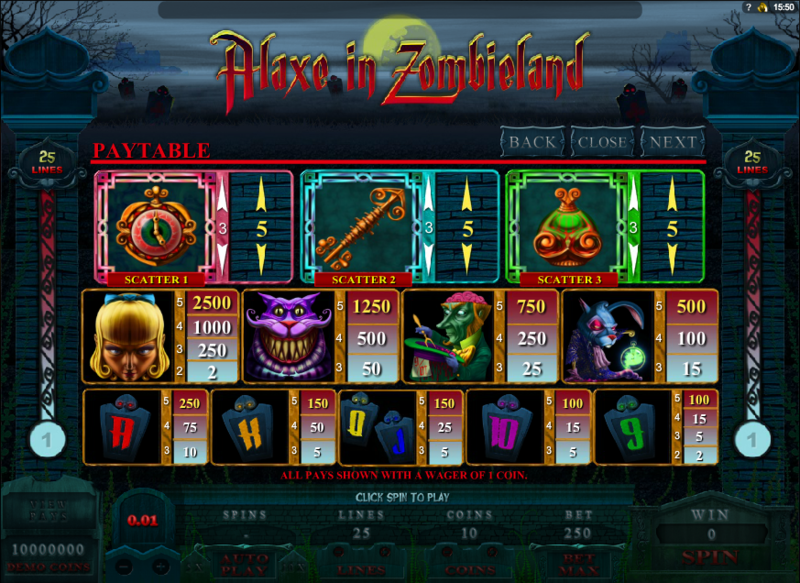 Some real thought has gone into Alaxe and it looks and plays like a slot which has been well designed and implemented. The bonus features seem to get triggered regularly and that’s a big plus for those who prefer all the extras. The fairytale-style graphics are also really well rendered.